There are several ways of identifying plant materials used in the manufacture of extracts for use in food & beverage as well as pharmaceutical related products. Most of these methods stem from the early apothecaries of the middle ages to the Nineteenth Century when herbal medicine was the only viable means of primary healthcare. Raw materials would be compared to physical descriptions of the plant in question but as technology advanced many pharmacopoeias introduced both macroscopic and microscopic descriptions, as well as simple wet chemical tests of preparations made from the plant materials. However it wasn’t until the latter half of the Twentieth Century before chromatography was introduced as a tool for identifying plant materials. The word chromatography has its origins in the Greek wordschroma and graphein and literally means to write with colours. It was first developed by the Russian botanist Mikhail Tswett in 1903 as a means of separating plant pigments on a column of calcium carbonate. Basically a plant extract in solution is adsorbed to either a solid or liquid support known as the stationary phase which is then eluted with a mobile phase which can consist of just water to mixtures of organic solvents which may be acidified or made alkaline by the inclusion of certain acids or bases. The net result is the separation of the constituents in the extract in an elution pattern which is governed by how they interact with the stationary and mobile phase. The technique was originally applied to coloured compounds but nowadays the development of powerful analytical tools has facilitated the detection of almost any plant natural product be it through their absorbance in UV light, refractive index, light scattering properties or by electrochemical detection. 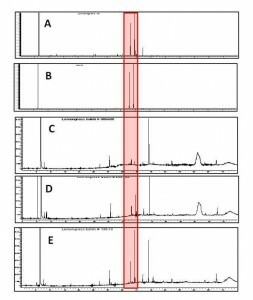 Of all the chemical fingerprinting tools available Thin Layer Chromatography (TLC), Gas Chromatography (GC) and High Pressure Liquid Chromatography (HPLC) are the most common. Nowadays, where relevant, most pharmacopoeias such as the BP and Ph. Eur. would include identification tests based on at least two of these fingerprinting tools in the herbal drug monographs. Chemical fingerprinting can be a useful tool for assessing the quality of raw materials. Natural products or phytochemicals have ecological roles in plants and thus their expression is largely governed by various biotic and abiotic factors. For example varying climatic growth conditions, stage of maturity when harvested, part collected, plant health as well as harvesting and subsequent processing practices all play a role in defining the chemical profile of plant raw materials. In addition traded raw materials can be adulterated with similar species of inferior quality or different species altogether. This is a particularly important when plant materials are received in milled form where macroscopic differences are less obvious. By utilizing chemical fingerprinting the presence or absence of marker compounds characteristic of the target species may be rapidly ascertained, quantified and referenced against the established range if standardized or quantified plant extracts are being considered. In a commercial setting quality management systems (QMS) would usually prescribe that plant raw materials are subjected to visual examination and other less informative tests such as loss on drying whereas the derived extracts are analyzed for parameters such as visual appearance, refractive index, density, % solids, pH, taste if applicable, heavy metal content and microbiological status. These tests may nevertheless fail to detect differences in the actual quality of the finished product, hence how it is going to perform for the customer. Chemical fingerprinting however is a definitive tool as it is will either confirm the presence or absence of the established chemical marker (s) in the plant raw material and thus will establish the correct identification and quality of the plant material. The availability of such information would provide confidence in the finished product delivering the desired qualities and thus meeting the expectations of the customer. Case Study – Lemongrass Strong Infusion What will follow now is a case study which highlights the importance of including chemical fingerprinting as part of the QMS for deciding to release raw materials for product manufacture. Ransom Naturals Ltd produces a wide range of ingredients for the food and beverage market. In the majority of cases these products consist of strong infusions prepared by steeping the selected plant material in either preserved water or aqueous ethanol overnight followed by filtration. The raw materials used to produce these products are generally provided in dry form and are sourced globally from regions such as Asia, the Americas, the Far East and Central and Eastern Europe. Raw material Lemongrass (Cymbopogon spp) from the Poaceae family consists of about 45 species distributed in the tropics and subtropics including India, Indonesia, Madagascar, certain countries in Africa and South America. It is a culinary herb with a citrus like flavour and has a traditional use as an ingredient in beverages. The citrus flavour of lemongrass is due to its essential oil content and more specifically the relatively high content of the monoterpene aldehyde citral (Fig. 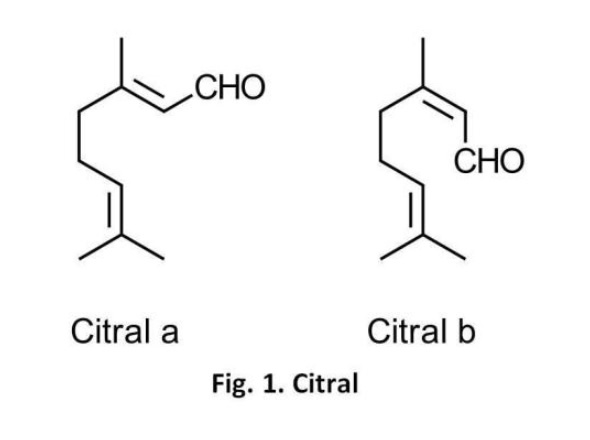 1) which occurs as two geometric isomers, namely geranial (citral ?) and neral (citral ?). Depending on the provenance the oil can comprise between 60-90% citral. The species of lemongrass utilized by Ransom Naturals is Cymbopogon citratuswhich is sourced as dried material from Thailand. Product Lemongrass Strong Infusion which is a dilute 20% aqueous ethanol extract of lemongrass leaves is the primary lemongrass product manufactured by Ransom Naturals. The product is used by a food and beverage company to manufacture pressé and cordials that are sold by several high street retailers in the UK. Challenge This product was initially approved on the basis of feedback received from the customer after evaluating a laboratory prepared R&D sample. Subsequent production batches were prepared but a number of these failed on sensory evaluation. Additionally an increase in the dosage by four equivalents by the customer still failed to get a match on the original R&D sample. Quality Control testing included GACP certification from the supplier of the raw material, appearance and loss on drying of the raw material along with sensory analysis of the finished product. 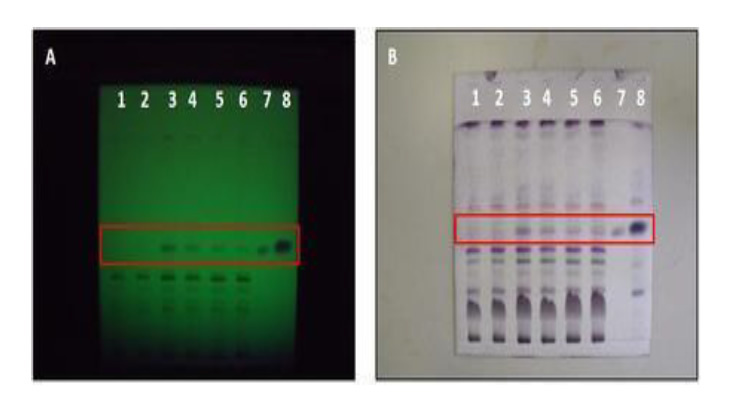 Chemical Fingerprinting of Lemongrass Raw Material Diethyl ether extracts from batches of raw material that were of different provenance (#339230, #136-13) including the raw material that was used to manufacture the defective product (#050436) were prepared. Each extract was concentrated and the chemical profile was determined by both TLC and GC. Reference compounds included citral and lemongrass essential oil. The TLC stationary phase was silica gel plates containing fluorescent indicator with toluene: ethyl acetate (93: 7) as the mobile phase. The plates were evaluated in UV light (254 nm) and after treatment with vanillin-sulphuric acid chromogenic reagent which is routinely used to detect essential oil components. The stationary phase for the GC analysis was a PE FFAP 60 m capillary column with helium gas as the mobile phase. Fig. 2. TLC profile of lemongrass raw material batches. (A) UV light (254 nm), (B) after treatment with vanillin-sulphuric acid chromogenic reagent. 1: #050436 a, 2: #050436 b, 3:#339230 a, 4: #339230 b, 5: #136-13 a, 6: #136-13 b, 7: Citral, 8: Lemongrass essential oil Fig. 3. GC profile of lemongrass raw material. 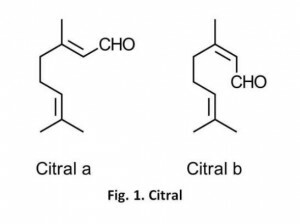 A: Lemongrass oil, B: Citral, C: #050436, D: #339230, E: #136-13Citral is an acyclic monoterpene aldehyde which contains a conjugated system of alternating single and double bonds in its structure (Fig. 1). Compounds exhibiting conjugation show absorbance in shortwave UV light (254 nm) and thus appear as dark quenching bands against a fluorescent green background on TLC plates equipped with fluorescent indicator. It can be observed from Fig. 2 that the different raw materials varied in their citral content whilst the raw material used to manufacture the defective batch of lemongrass strong infusion was deficient in citral. Treatment of the TLC plate with vanillin-sulphuric acid reagent also confirmed these findings with citral appearing as a dark purple band of varying intensity depending on the raw material batch (Fig. 2). 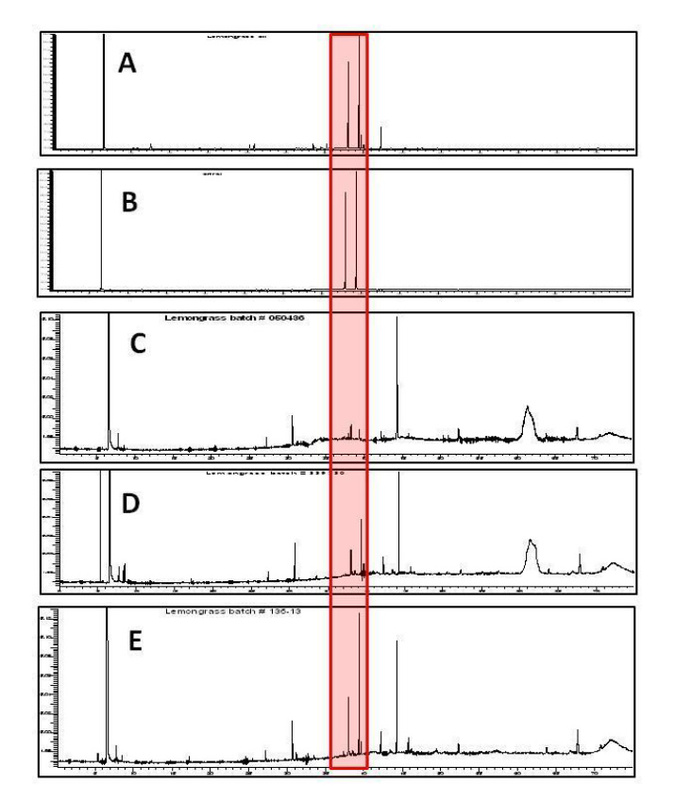 This result was also confirmed by GC profiling of the extracts (Fig. 3). Lemongrass essential oil is characterized by two major peaks eluting off the column after about 38 and 39 minutes which correspond respectively to the two citral isomers, geranial and neral. The results showed that the different batches of raw material varied in the intensity of these peaks with citral being barely detectable in #050436, the raw material batch used to produce the defective product. These results are compelling evidence that the root cause of the problem lay with the particular raw material used. Further investigations revealed that the defective raw material was oven dried at source whereas the other raw materials were air dried. The quality of lemongrass oil is determined by its relatively high citral content. The literature shows that oven drying adversely affects the quality of lemongrass oil which is reflected in the results obtained in the present work. Chemical fingerprinting is an essential tool to be included in the quality control of herbal raw materials. Unlike some tests such as loss on drying and appearance of raw material it is definitive as it will unambiguously determine whether the potential or known active compounds are actually present in the raw material before it is released to produce a product. This is of critical importance if, as in the case of citral and lemongrass, the compound is known to contribute to the flavour of extracts derived from the raw material. Ascertaining this information early on in the manufacturing process will prevent unnecessary expenditure of labour on utilizing deficient raw materials and would thus help to keep operational costs to a minimum. Here at Ransom Naturals Ltd chemical fingerprinting is routinely used in the quality control of our raw materials and finished products.